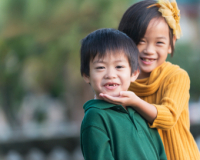 Read the articles here for recent news and important information that will help you make the appropriate choice for orthodontic treatment in Vancouver. Healthy primary (baby) teeth help kids chew their food and aid in digestion, and are one of the most important parts of their oral development as they grow up. Most orthodontic patients lead busy lives at school, work, and social obligations and it keeps them away from home throughout the day. This is a list of supplies which you should keep on hand to care for your braces when you're-on-the-go. To remove the plaque that can build up quickly in their crevices, braces need to be cleaned thoroughly on a regular basis. An electric toothbrush can make brushing your teeth with braces easier and more effective. For patients who want a gentler, more streamlined orthodontic treatment option, In-Ovation System self-ligating braces are great option. Here are some factors to consider before choosing In-Ovation. Orthodontic patients all have one thing in common: they all learn to adjust! This is true during treatment, and after it's over, too! 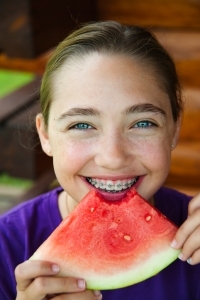 Flossing can be more than a little tricky to master when you first get your braces! The following instructions and tips will help you effectively floss with braces, and keep your teeth and gums healthy during treatment. Invisalign is an orthodontic treatment method for adults and teens who want to straighten their teeth without the obvious look of braces. But before choosing Invisalign, there is some important information you should consider. Many teens and even adults worry about what it will be like to date with braces. Here are some tips and ideas for not letting your braces get in the way of your romantic endeavors! You probably know that to have your teeth straightened, you go to an orthodontist. But you may not know exactly what it entails to be an orthodontist. Today, we’d like to enlighten you! Occasionally, our patients encounter an emergency situation related to their braces or orthodontic treatment. Find out how to recognize an emergency, and what to do about it! For many people considering orthodontic treatment, one of the aspects they have the most questions about is how treatment will impact their daily lives. When you first get your braces and after adjustment appointments, the inside of your mouth may be sore and tender for a time. A saline rinse is a quick and easy way to manage your discomfort and promote healing. Lingual braces provide an orthodontic treatment option that forces you to be consistent (unlike removable aligners), but is still essentially invisible when worn. However, like all orthodontic treatment options, they have their pros and cons.